Scientific research links hypothyroidism to 4 of the deadliest killers of our time - heart disease, diabetes, breast cancer, and Alzheimer's disease - yet the lack of awareness is pervasive. It's time for change. 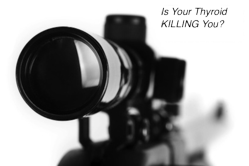 Is Your Thyroid Killing You? I was shocked to find literally hundreds of published research articles linking hypothyroidism to some of the deadliest diseases of our time. Who knew that little butterfly-shaped thyroid gland at the base of our necks had the power to kill us? Hypothyroid Mom reveals research that links hypothyroidism to heart disease, diabetes, breast cancer and Alzheimer’s. Despite the scientific literature connecting hypothyroidism to many of the deadliest diseases of our time, the lack of awareness is pervasive. The mission of HypothyroidMom.com is clear – to drive awareness. Heart Disease is the number one killer of women, and is more deadly than all forms of cancer combined. What most people don’t know? That small butterfly-shaped thyroid gland at the base of our neck produces hormones that are essential for keeping the heart working properly. A low thyroid can lead to high cholesterol, high blood pressure, high Cardio CRP (C-reactive protein) and increases the risk for atherosclerosis, heart attack and stroke. 347 million people worldwide have diabetes. The World Health Organization warns that its escalating rates around the world will result in the doubling of diabetes deaths between 2005 and 2030. What most people don’t know? Both type 1 and type 2 diabetics have an increased risk of thyroid disease. 50% of people with diabetes die of cardiovascular disease. The legendary thyroid pioneer Dr. Broda Barnes wrote that many diabetic patients are in fact hypothyroid and the heart disease that manifests in these diabetic patients is due to thyroid deficiency. Breast cancer is currently the top cancer in women worldwide. What most people don’t know? The relationship between hypothyroidism and breast cancer has been a topic of debate in the scientific research for over 50 years. In 2012 a meta-analysis was conducted that revealed significant evidence of an increased risk of breast cancer in patients with anti-thyroid antibodies and goiter. Alzheimer’s is the sixth-leading cause of death in the United States and the only cause of death among the top 10 deadliest diseases in the country that cannot be prevented, cured or even slowed. What most people don’t know? Over a follow-up period of 12.7 years, close to 2,000 participants from the legendary Framingham Study were tested periodically for thyroid function and dementia. The study found that women with TSH (thyroid stimulating hormone) levels below 1.0 and those with a TSH above 2.1 had a greater than two-fold higher risk of developing Alzheimer’s disease. The results of these studies are particularly disturbing given that the Thyroid Federation International estimates there are up to 300 million people with thyroid dysfunction worldwide yet over half are unaware of their condition. Imagine, there are over 150 million thyroid sufferers around the world right this minute with no idea they suffer from a thyroid condition that puts them at risk for heart disease, diabetes, breast cancer and Alzheimer’s. The time has come to spread awareness. Founder Dana Trentini graduated in 1993 with an Honors Bachelor of Science degree in Neuroscience from the University of Toronto with High Distinction receiving multiple scholarships and prestigious awards. At Columbia University in 2002, Dana obtained an M.A. in Organizational Psychology and an Ed.M. in Counseling Psychology. A distinguished Columbia University professor selected her as team leader for his research team during the course of her studies. After the miscarriage of her baby due to insufficiently treated hypothyroidism, Dana took her science and research skills and immersed herself into the scientific literature on thyroid disease. She was shocked by what she discovered. HypothyroidMom.com is for the millions of moms worldwide with hypothyroidism (and the millions more who don't even know they have it yet). Founder Dana Trentini lost her unborn baby to hypothyroidism and vowed to warn women everywhere about the dangers. After 3 years of intense research and a quest to find the top thyroid health experts, the time has come to share all that she has discovered.